Expands the Japanese art market by participating in the fair. The NEW CITY ART FAIR was held at “Huashan 1914 Creative Park” in Taipei by H.P. France. This park used to be part of liquor factory but was renovated to make an art and culture center by the support of various artists. This event was held in New York this March. 12 Japanese galleries joined the event in Taipei. 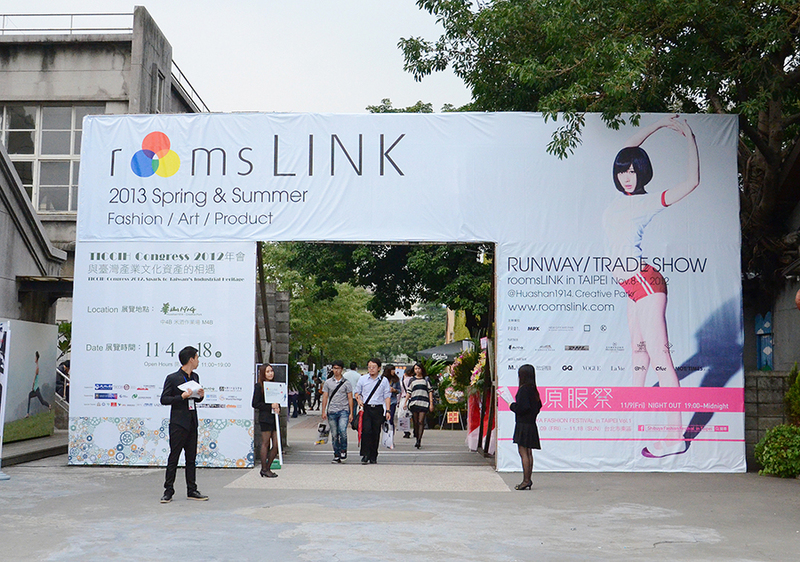 The fashion exhibition called “roomsLINK” was a new event. 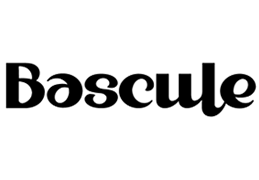 The aim of this was to tie interiors, fashion and products together. This was not done in New York. ART Taipei, the art fair with the longest history in Asia, was held at the same time. Visitors were able to go to both with a free shuttle. 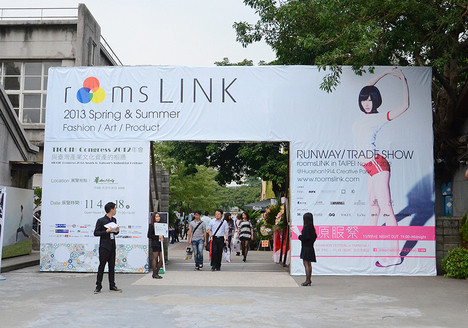 The following were the galleries that joined the fair. 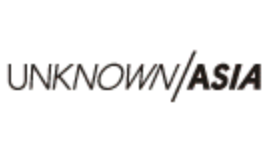 ASIAN ART AUCTION ALLIANCE is an auction company from Hong Kong. They presented the works of Yayoi Kusama, Yoshitomo Nara, Tsuguharu Fujita, Tetsuya Ishida and other artists. Ishida was an artist who died young; it was moving to see young people staring into his works. It seems like they are sharing the same world with Ishida. 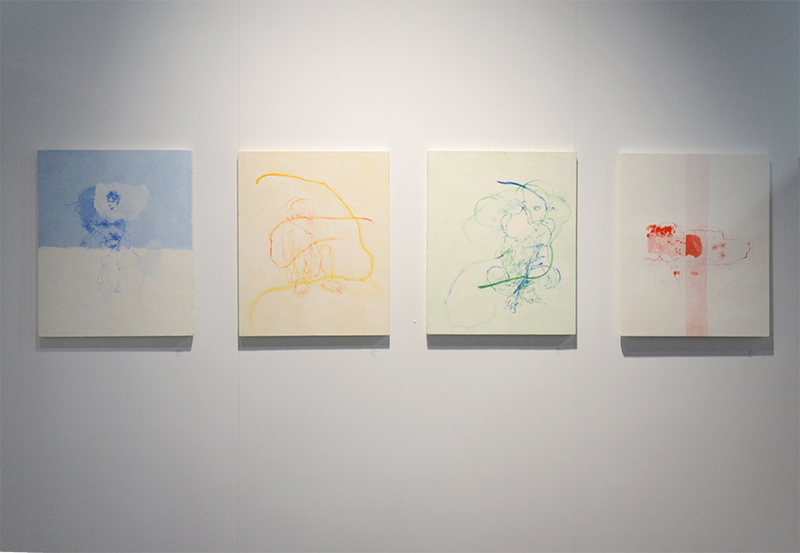 Tokyo Gallery +BTAP introduced Danshaku Miyazawa’s work called “coming and going”. 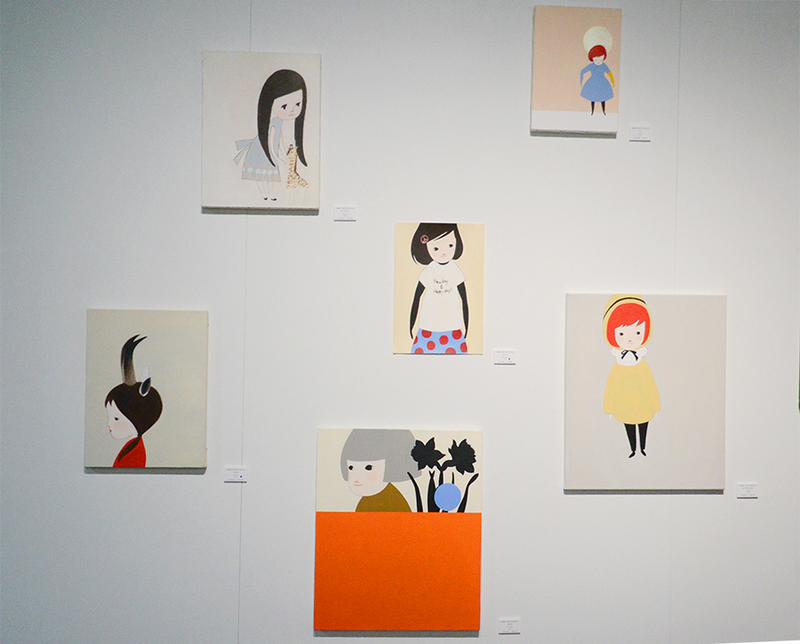 It is a series of drawings and paintings. The first one is a drawing in pencil, then the next is a watercolor painting, then an oil painting. Although the forms of the works were different, his world was always present. The works above are his new oil paintings. His sensitive world strongly attracted visitors. 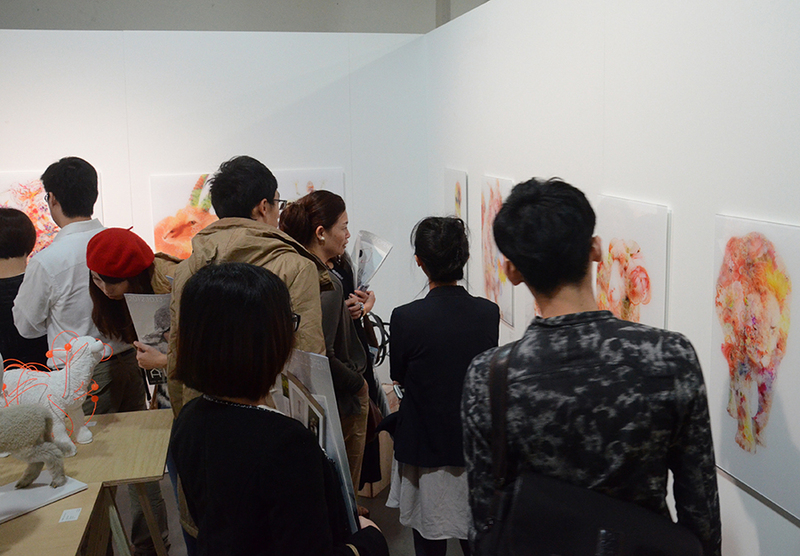 Tokyo Gallery +BTAP also presented Nozomi Kobayashi’s frail drawings, Namiko Kitaura’s beautiful pictures and the works of Chiharu Nishizawa who is very popular in Taiwan since her solo exhibition in Taipei. The photographs of Little Red Riding Hood by Ayano Sudo stood out at the booth of the Picture Photo Space. The photographer herself wore a Little Red Riding Hood outfit. She also took a picture of an art dealer couple in New York. She played the role of an art dealer’s wife. She plays the role of a boy or her acquaintances in other works. She fully showed her aesthetics in the works. mograg garage exhibited various artists. One of them was NANOOK who was selected for SHIFT 2010 Calendar. Emi Inami was selected for SHIFT 2012 Calendar. 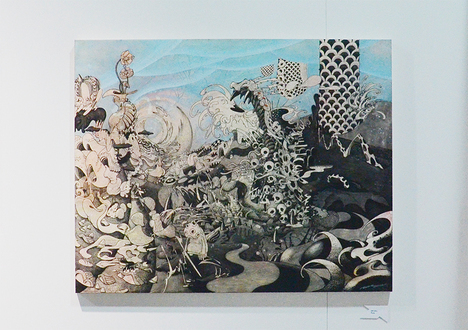 Yusuke Gunji, who had joined AOSANDO ART FAIR, showed his unique fancy world in his works. On the other hand, the image of death was momentarily shown by Okichu in his work. But there was hope in his work after staring. Yusuke Shimura from Yumiko Chiba Associates entertained visitors with his live painting at the entrance. Yumiko Chiba Associates also introduced the series of works called “ceremony” by Takuma Uematsu. The motifs for them were animals and flowers. Their works always reminds us of the relation between nature and science. Watching their works is just like traveling the world beyond time and space. 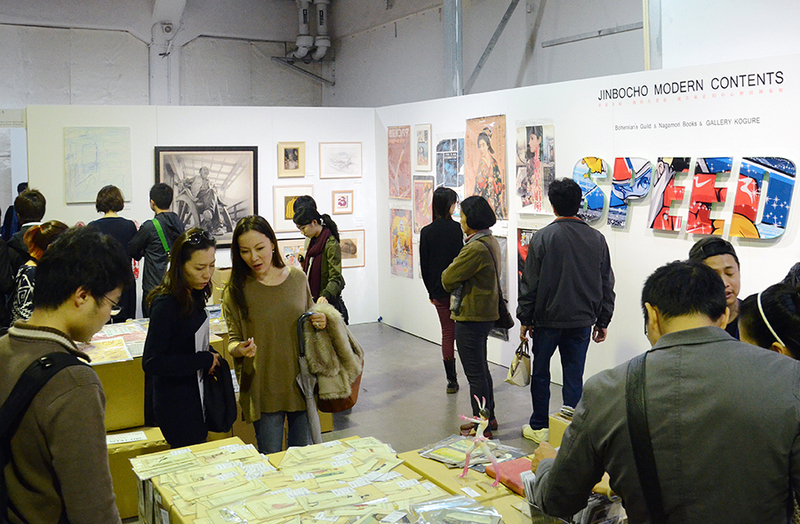 Jinbocho Mordern Contents consisted of three groups, Nagamori Book store, Bohemian’s Guild and GALLERY KOGURE, exhibited together. Their exhibitions ranged from antic postcards to posters by Keiichi Tanaami. Visitors were able to take the works in their hand. The Emigre Collection showed the works of Sunae (Sand painting) by Naoshi. Her works were previously introduced in the illustration magazine “dpi Magazine”. She captures things from our daily lives, and her works describe how the world spreads out from the perspective of the objects. She must enjoy making her works. 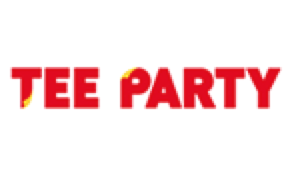 They magically make people happy. COEXIST-TOKYO/EARTH+GALLERY runs an art space and holds an event about art. An “ecosystem artist” KOHEI produced his works from square cut Charcoal. The color of charcoal is different depending on where you look. Every charcoal is different. No two charcoals are the same in this world. It was like seeing human characters. The exhibition in Ohshima Fine Art was enjoyable. Children in the work of Katsunori Miyagi have animal ears and horns. Humans in his work are not human. 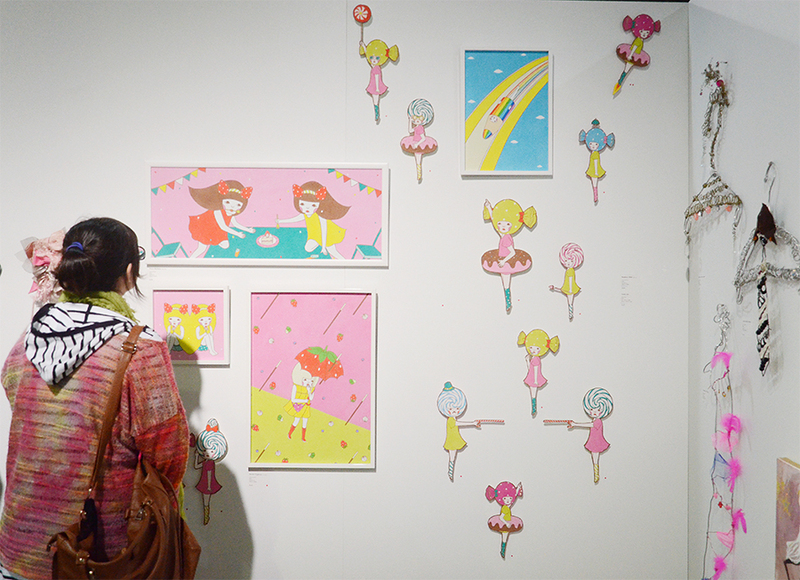 His works enable people to go back their childhood and make them happy. 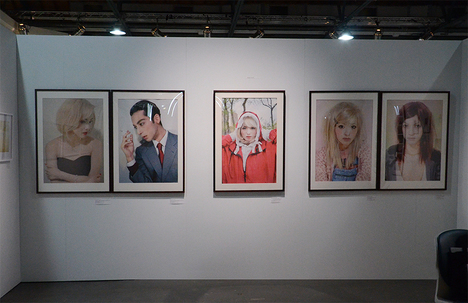 hpgrp GALLERY TOKYO. Tamaki Shido’s picture looked like a single picture but it actually is a collage of many images. Rich, who took a picture for the main visual art in this art fair, introduced his scooter and animal series. The animal series looked like a beautiful movie. It even seduces the viewer into the light of the work. At the Gallery Ten, there were some white potteries. 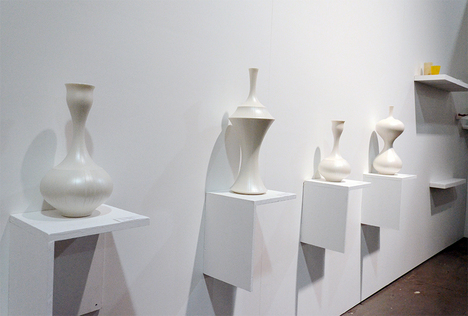 They were Hiroshi Nakada’s “pearl light potteries”. They were just like constructed towers. His works have a great presence anywhere. Works by Toshihiko Shibuya visualized butterflies flying on white paper. 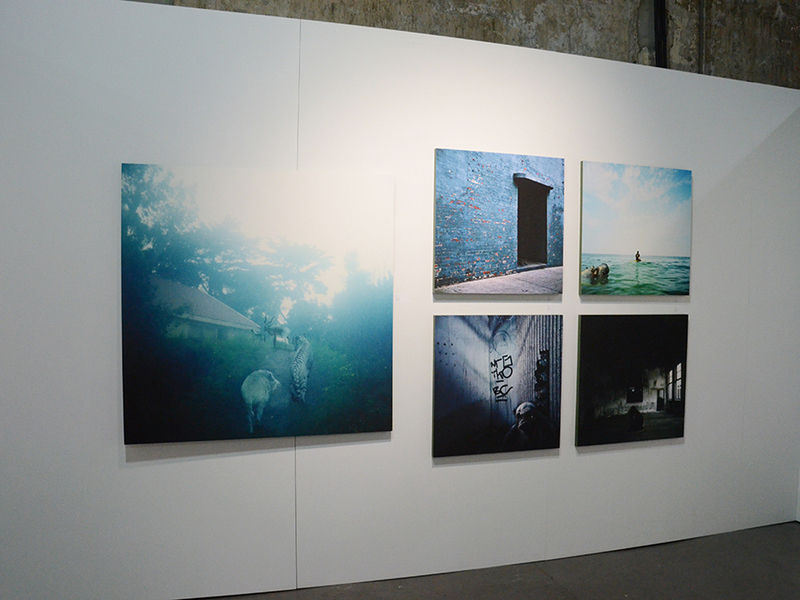 It was at Clark Gallery+SHIFT, which is the only gallery that came from Hokkaido. The butterflies were colored on the rear side of the paper. The color reflected in many ways depending on where the light came from. His work looked like butterflies flew on the snow under the moon light and you could almost hear sounds like falling the snow. It gave people calm and gentle feelings. 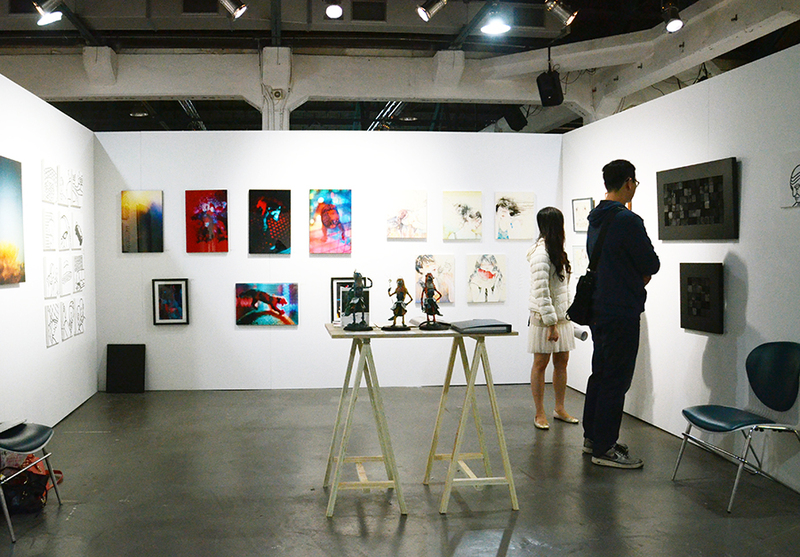 The fair director Kentaro Totsuka said, “there were 35,000 visitors for this second New City Fair, and it rose interest in Taiwan as the first creative event. 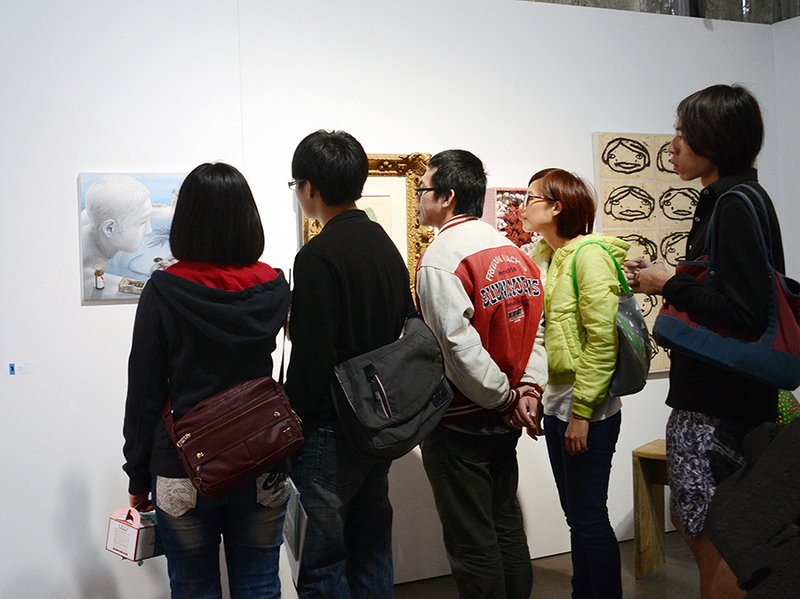 Twelve galleries from Japan gathered and there were various art works. It proved how widespread art in Japan is. 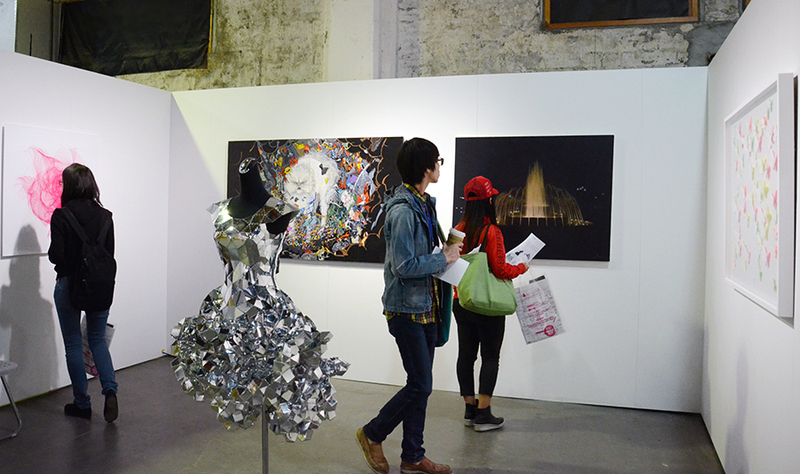 And it enabled non-art lovers to have interest by connecting with fashion and design. This fact would lead to more young art collectors in the future. The next event will be held in New York in March 2013, and in Osaka in April 2013. 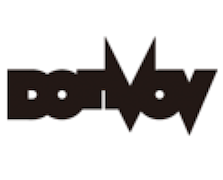 In order to introduce Japanese contemporary art, we will aggressively have events all over the world”.